DuPage family law firm A. Traub & Associates, LLC Promotes Senior Attorney Chantelle A. Porter to Partner. “Chantelle has been a phenomenal asset to A. Traub & Associates and just all in all great to have around. Her unwavering commitment to the local legal community and her clients is impressive," says Principal Owner Angel Traub. The Lombard family law firm of A. Traub & Associates is pleased to announce that Senior Associate Chantelle A. Porter has been promoted to Partner. Porter joined A. Traub and Associates in 2008. “Chantelle has been a phenomenal asset to A. Traub & Associates and just all in all great to have around. Her unwavering commitment to the local legal community and her clients is impressive. It was an easy decision to name Chantelle as a partner and we look forward to her success within this new role,” says Principal Owner of A. Traub & Associates, Angel M. Traub. 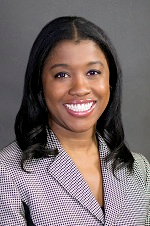 Lombard divorce lawyer Chantelle A. Porter earned her J.D. from DePaul University College of Law and earned her B.A. from Ohio State University. Porter concentrates her legal practice on family law, juvenile criminal defense, domestic violence, orders of protection and DCFS abuse and neglect cases. She also assists clients with landlord and tenant issues and civil litigation defense. Porter is a Guardian ad litem and an appointed Juvenile Conflict Attorney in the 18th Judicial Circuit. Porter is active within her local legal community. She currently serves on the Board of Governors for the Illinois State Bar Association (ISBA). She is immediate past-president of the DuPage Association of Women Lawyers (D.A.W.L.) and has served on the Board of the DuPage County Bar Foundation (DCBF). Porter is a past director of the DuPage County Bar Association (DCBA), and a past member of the Robert E. Jones Chapter of the American Inns of Court. Porter is a Top Rated Family Law Attorney on Avvo.com with a 10.0 rating based on exceptional peer endorsements and client reviews regarding her experience and professional conduct. She has been selected to the Super Lawyers Rising Stars list from 2012-2016. In 2009, Porter received an Outstanding Service Award and Pro Bono Service Award from the DCBA. The association also presented her with the “Women to Watch” award in 2008. The DuPage family law firm A. Traub & Associates has office locations in Lombard and Arlington Heights, Illinois. The firm represents clients throughout the Chicagoland area and its suburbs, including DuPage, Cook, Will and Kane counties. The dedicated attorneys assist clients with a wide array of legal services including: family law, criminal law, estate planning, and business related matters. Call 630-426-0196 or visit http://www.atclaw.com for more information.